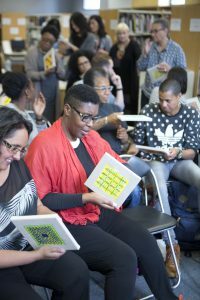 On 20 June, Iniva and BAM (Black Artists & Modernism) co-hosted a study day in the Stuart Hall Library focused on the work of artist Lubaina Himid (1). The aim of the day was to generate new readings of the artist’s work, invite personal responses from a range of perspectives and inspire continuing dialogue. One of the main premises of the BAM project is that the work of Black artists is often over-determined by sociological readings, which focus on an artist’s ethnicity and identity rather than a critical consideration of their practice and the aesthetic and material qualities of their work. In the case of Lubaina Himid, this study day was an opportunity to attempt to redress the balance (2). Enveloped in an atmosphere of openness and generosity, the study day provided a platform for thought-provoking presentations and rigorous discussion, and the artist’s presence at the event lent it a particular spirit of warmth and welcome. In our invitation to contributors and participants, we were keen to elicit a range of responses to Lubaina’s work across different generations and practices, and among the thirty or so voices that fuelled and animated the dialogue were eminent academics such as Griselda Pollock, artists and curators inspired by Lubaina’s work including Phoebe Boswell, Hansi Momodu-Gordon and poet Rommi Smith, and those who will be working closely with the artist over the coming months on new shows and commissions, including Sam Thorne, Director of Nottingham Contemporary. The first presentation was by Jane Beckett, Professor of Contemporary Art at New York University in London, who asked us to examine what it is that the work does in the world. Highlighting Lubaina’s sumptuous approach to paint and the sound of words in her use of text, Jane proposed that we consider the performative aspects of writing and painting in the artist’s work and how her acts of cutting out and collage are deliberately intended to make an impact in the world. On the one hand, she suggested, Lubaina’s work exudes a sense of uncertainty and ambiguity, while on the other her very definite acts of making offer an invitation to engage, and there is thus both a vulnerability and an openness to her practice. An impending sense of danger and unease inhabits many works, as does a continual return to the sea and Jane evoked resonances with both Turner and Maggie Hambling in Lubaina’s depictions of currents and tides. Dorothy (Dot) Price, Reader in History of Art at the University of Bristol, focused on Lubaina’s Revenge series (1992) in her presentation. She suggested that the rhythmic warp and weft of colour, pattern and text across the five tableaux that make up this series invite a reading that is cyclical rather than chronological or monological. Abundant with textiles in various forms, from robes to rugs, sails to tents and flags, these works are laden with multiple meanings and evoke both an engagement with and a disruption of Modernism. Carpet, a painting from the series, resists pure abstraction while, Dot suggested, recalling Matisse’s Snail (1953). Textiles were also the starting point for the series of works discussed by curator, critic and art historian Christine Eyene; Kangas from the Lost Sample Book (2011/12). These works on paper consist of collage portraits alongside the artist’s interpretation of East African ‘kangas’. Lubaina had made this work after spending time in the textiles department at the Whitworth Gallery, and an interesting discussion evolved during the study day about how these printed fabrics are being worn by contemporary women while simultaneously being held in museum collections. 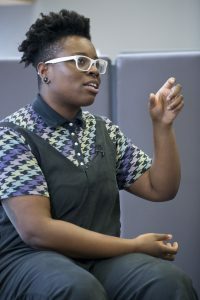 Evan Ifekoya’s performative presentation gave an insight into the common threads between Lubaina’s work and the younger artist’s practice, which is permeated by themes of appropriation, pattern, play and storytelling. Both artists are interested in intervening in what’s already happening, making do with the situation and employing collage as a strategy, while Evan emphasised how making a spectacle of oneself is a political act and invited us to consider the aesthetic operation of the disco ball, which both reflects and refracts. Throughout the study day the conversation kept coming back to the possibilities of flux, of attracting and repelling, of how the material qualities of a work can simultaneously draw you in and push you away. Lubaina shared with us that why she finds Bridget Riley’s work so powerful is her use of paint to reveal astonishingly clear narratives while simultaneously maintaining a sense of obscurity and secrecy. We discussed scale and speed, and the artist explained that while earlier works were ‘fast and wet’ there is less urgency now and she has become a quiet, meticulous, obsessive painter making tiny patterns for hours at a time. Making series has become a way of life for her, and while the individual pieces might be small they often form part of larger installations, revealing wider historical narratives through a collection of individual stories. For many of us the highlight of the day was the close reading of works from the series Inside the Invisible (2002). Lubaina had brought with her twenty four of the hundred small works on raw linen that had formed her site specific installation at the St. Jorgen’s Museum, a former leprosy hospital in Bergen, Norway. The intimacy of handling the work was an incredible privilege, and having the canvases to hold, feel, absorb and discuss engaged both the senses and emotions. In the centre of each eight inch square canvas was a five inch square painting, a unique pattern in many colours, and attached to the back of each was a handwritten luggage label (in Norwegian on one side and in English on the other). Each painting alluded to an individual patient from the hospital, the unique pattern and label giving us a sense of their story beyond their illness. Being able to physically touch the works enhanced their emotional resonance, as we encountered a sense of community through touch and the rhythm of the canvases and their labels suggested voices in different registers, some whispered, some more determined. Almost two months on, many of the new lines of thought generated through the study day are still resonating as I consider speculative maps that traverse seas and negotiate grids, circling back and forth between escape and arrival, intimacy and distance, and I find myself reflecting on how a language of colour and pattern can be evocatively mobilised to reveal hidden narratives that dwell ‘inside the invisible’. 1. 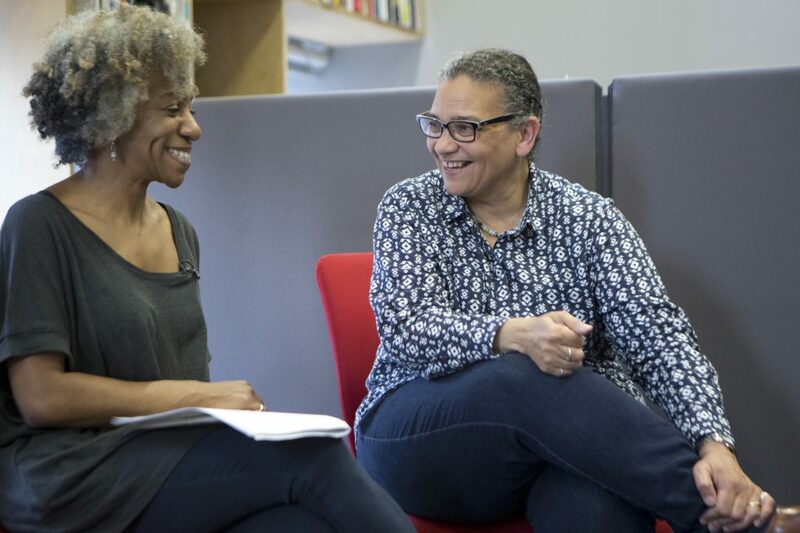 Lubaina Himid is Professor of Contemporary Art at the University of Central Lancashire. She has long been associated with the UK Black Arts Movement, and as a painter, writer and curator has participated at an international level in exhibitions, conferences, books and films on the visual art of the Black Diaspora since the early 1980s. During the past 30 years she has exhibited widely both in Britain and internationally, with solo shows including Tate St. Ives; Transmission, Glasgow; Chisenhale, London; Peg Alston, New York and St. Jorgen’s Museum in Bergen. She represented Britain at the 5th Havana Biennale and has shown work at the Studio Museum in New York, Track 17 in Los Angeles, the Fine Art Academy in Vienna and the Grazer Kunstverein. Himid’s work can be found in public collections including Tate, Victoria & Albert Museum, The Whitworth Art Gallery, Arts Council England, Manchester Art Gallery, The International Slavery Museum in Liverpool, The Walker Art Gallery, Birmingham City Art Gallery, Bolton Art Gallery, New Hall Cambridge and the Harris Museum and Art Gallery, Preston. 2. 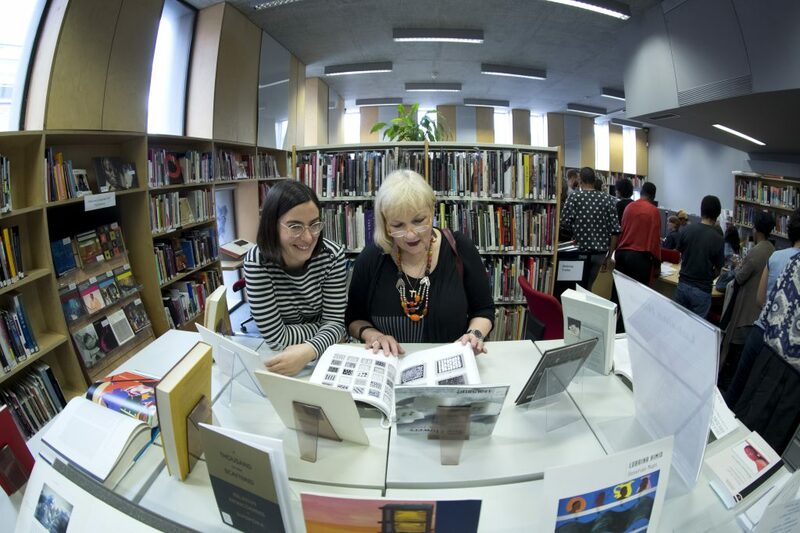 This study day was the first event in an ongoing collaboration between BAM and Iniva. Upcoming events include the conference Now & Then, Here & There: Black Artists and Modernism, and a study day focused on the work of artist Li Yuan-chia.